When you searched for your classic or specialty car, you most likely took time to find the one that would best fit your budget and lifestyle. At Vines Storage, we understand a car is an investment. We are committed to helping you keep one of your most valuable assets safe and secure with our car storage facility in Redlands, CA. We are one of the top choices among those who live in California for car, RV, and self storage. We provide various storage options at an affordable cost. Our indoor car storage facility ensures your car is protected from humidity, extreme temperatures, mold, rodents, and environmental disasters. We offer peace of mind to our clients with a 32-camera video surveillance system always looking over your belongings. Elimination of costly repairs – When your car is exposed to the elements, the result can be expensive repairs. Storing your car in a room-temperature, dry facility will prevent rust, mold, and metal-to-metal parts from sticking. This results in long-term cost savings. Safety – Rest easy knowing your car is in excellent hands at our facility. Our staff monitors a gate seven days a week from morning until evening. Gate access is only granted with a code. Convenience – Not having to park your most prized possession in your garage at home will leave space for the car you drive daily. At Vines Storage, we want to help you have the most positive experience with vehicle storage. Therefore, we believe it is important to follow some tips if you are only storing the vehicle for several months. Filling up the gas tank will help keep moisture and condensation from developing, which can cause damage. Fill the tires with air before storing the vehicle. Change the oil to ensure fresh oil circulates through the engine. If possible, drop by to take the vehicle for a quick drive every couple of weeks. We would love to help you take care of your property with storage options that are safe, reliable, and highly trusted. 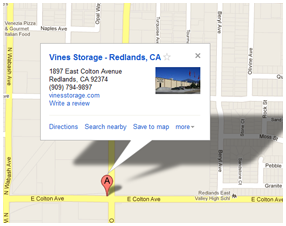 Call Vines Storage at 909-389-6209 for more information.